You are managing multiple priorities in your life, including work responsibilities, family commitments, and financial goals. You are also ready to pursue a graduate degree because you understand how that can help you advance all of these priorities. I have good news for you: You’ve come to the right place. The online programs offered by St. Bonaventure University bring our excellent academic programs and highly regarded faculty to you wherever you are. We enable you to fit your studies into your life, according to your schedule. However, our programs are so much more than just convenient. The engagement with fellow students and your faculty will challenge your ways of thinking, and form relationships that will continue even after your program ends. We will also prepare you for career advancement or maybe even a career change. At St. Bonaventure University, we believe in the ability of every person to do extraordinary things. It is our mission to enable you to exceed your expectations through higher education. At the same time, we know you can make a difference in the world, and we think our unique educational experience will help you to discover or further develop that potential – your personal and professional mission, if you will. Please accept my best wishes for your success in your online program. I look forward to supporting your studies through the Office of the Provost in any way that I can. Complete the form to receive more information about our programs, and to download our free job guide. Yes, I hold a Baccalaureate Degree. St. Bonaventure University Online's technology partner works with multiple universities to offer online programs. "St. Bonaventure’s leadership program was the best decision I made to help me grow both professionally and personally. Not only did I make lasting connections and friendships, but I was provided the skill sets to further enhance my abilities in the corporate world. Shortly after completing the program, I was promoted to the international side of my company and have continued to grow. 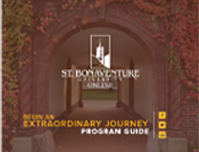 It is true, St. Bonaventure University is the place to become extraordinary! Sullivan, who earned her Master's in Professional Leadership from St. Bonaventure, is international business development manager (Asia) for Zippo Manufacturing Company in Bradford, Pa. "
U.S. News & World Report ranked St. Bonaventure University as #1 in New York for best value. Our School of Business is among just 5% of business schools to be globally accredited by the AACSB. The online programs average a 10:1 faculty to student ratio. As a military-friendly college, our online Master of Strategic Leadership program offers a 30% tuition discount to all active military. Whether you have a simple question or need advice to determine if this program is right for you, our knowledgeable advisors are here to help. They can chat with you on your schedule and guide you through the entire admissions process so you can feel confident in moving forward with your online St. Bonaventure University program.